provides information about the new Java virtual machine (JVM) server technology in IBM CICS� Transaction Server for z/OS� V4.2. We begin by outlining the many advantages of its multi-threaded operation over the pooled JVM function of earlier releases. The Open Services Gateway initiative (OSGi) is described and we highlight the benefits OSGi brings to both development and deployment. Details are then provided about how to configure and use the new JVM server environment. 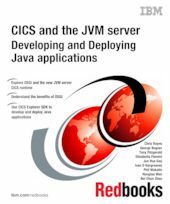 The book continues with a comparison between traditional CICS programming, and CICS programming from Java. As a result, the main functional areas of the Java class library for CICS (JCICS) application programming interface (API) are extensively reviewed.